This workshop, facilitated by Chetna, will leverage delicious tools in mindfulness, meditation and expressive arts to practice creating, soothing, and healing ourselves and one another with the power of our hands. No one turned away. Love offerings also accepted i.e. tea, tea lights, drawings, crafts, anything from the heart. With a new year and season, we could benefit from a safe and creative space + a purposeful tool that soothes, empowers and deepens us in the present. 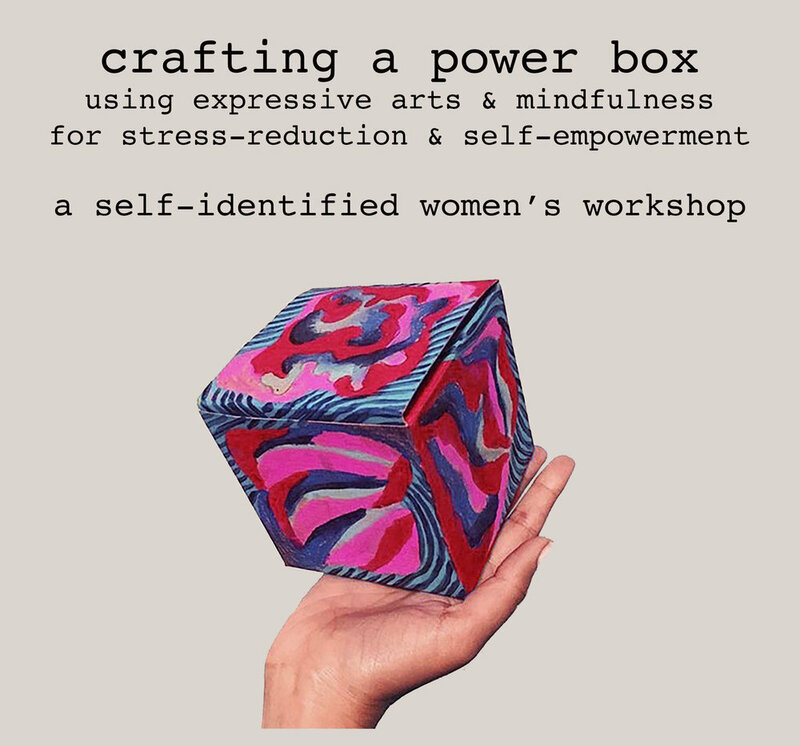 Join in crafting a sacred power box: an effective and therapeutic wellness tool for grounding, getting present + being reminded of what’s important to us. We'll take time to be creative in circle, bring awareness to our senses, & practice mindfulness while creating a uniquely-tailored resource that will set us up nicely for an even more powerful, supported and intentional new year. This workshop is open to all self-identified women, thank you for honoring the safe space. What is a "power box"? A power box, also known as a calm box or soothing box, is an evidence-based wellness tool known to help with stress, anxiety, depression and emotional dysregulation. It's used therapeutically, along with mindfulness (the practice of being fully present) to focus on positive stimulation from our senses, while using specific and positive memories from our lives. The power box is intentionally curated to inspire peace, awareness of our body intelligence, and remembrance of how we are empowered, capable and successful. She has a Master's in Counseling Psychology from the Wright Institute in Berkeley. She's facilitated creative workshops, and this one in particular, with teenagers in a school-based context, with multigenerational and multicultural adults in intimate retreat and studio settings. Join us to self-generate, reflect, release and shed light on ourselves individually and in a community with other women in this 2-day workshop. We’ll be deepening our awareness of our multiplicity within, including our powers and conflicts; and with the upcoming turn of winter from autumn, we'll practice the art of letting go and calling in, and bringing sight to the multitude and shades of ourselves. How does my past affect how I show up in the world today? How can I recreate a self-narrative that’s more empowering and purposeful? What do I want to release from my past? How do I use my senses and body’s feedback to ground more in the present? How can I clarify and speak my needs effectively? What’s my personal statement for the current season? How can I step more fully into an expanded realm of possibility? The workshop will run on Saturday, December 8th and December 9th from 9am to 6pm. We’ll gather in Chicago; receive the specific location after you apply. Tuition covers program materials, breakfast and snacks foods + tea and coffee, and location, as well as organizing time and honoraria for facilitators. Natalia Smirnov is a human, writer, scholar, educator and media and experience maker. Born and raised in Russia and molded in the suburbs of New Jersey and art colonies of Philadelphia, Natalia carries the grit and glory of each of her homes as part of her deeply nomadic identity. Natalia’s current home is Chicago, where she is completing a PhD in Learning Sciences at Northwestern University. Natalia holds a B.A. in American Culture & Media Arts and a graduate certificate in Diversity Leadership (with training in Transformational Social Therapy) from Temple University. Natalia has a long history of creating and supporting youth, girls', and women's empowerment projects through social justice and arts-based organizing. 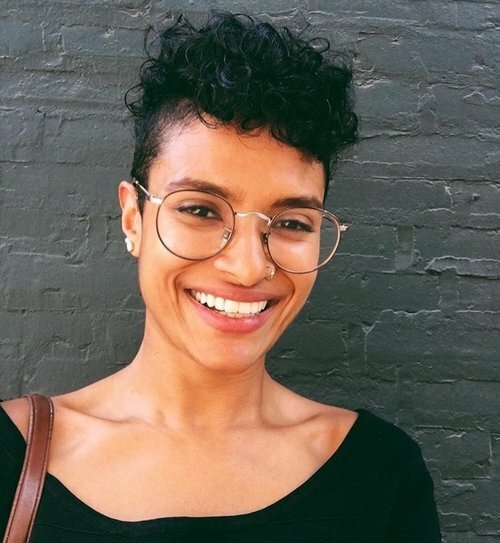 She has taught video production, civic journalism, media literacy, music making, web development, human-centered design and multidisciplinary art-making in Philadelphia and Chicago. In addition to research and teaching, Natalia designs and facilitates immersive game experiences to engage participants in critically examining issues of social inequality and cultural difference; organizes nurturing gatherings and writing retreats; and collaborates with educators and organizations to help them analyze and improve their pedagogy and assessment practices. Emily Harburg is the co-founder and Director of Programs for Brave Initiatives, a nonprofit dedicated to helping women build skills in coding, design and leadership for social impact. 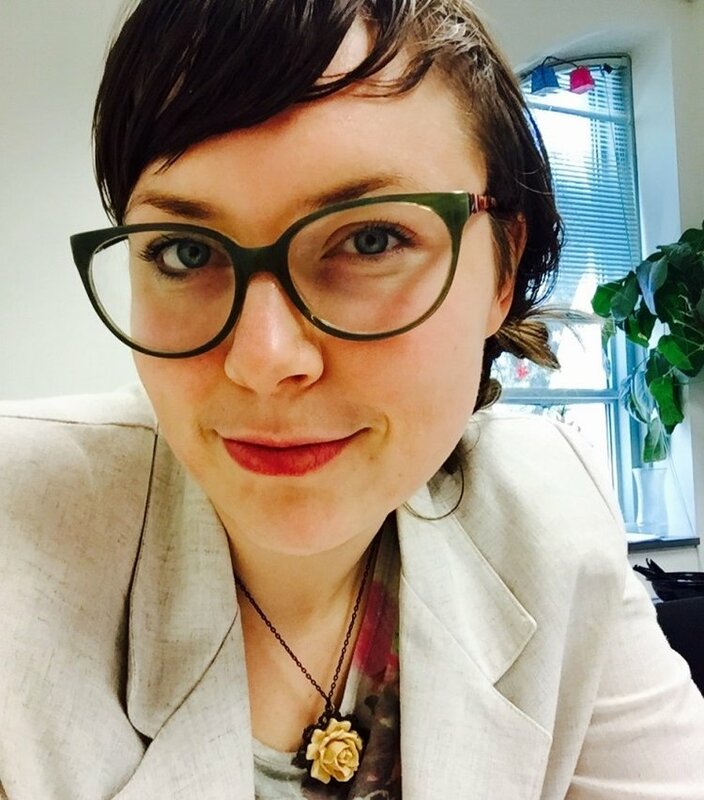 Emily is also a doctoral student in the﻿ Technology and Social Behavior﻿ PhD program at Northwestern University where she builds and researches online tools to improve motivation, collaboration, and self-efficacy. Her work has been published in academic journals, Harvard case studies, and news publications. Emily has industry experience working for Walt Disney Imagineering in the ﻿Disney Research﻿ behavioral sciences team, and as UX Researcher at Facebook. She is also the cofounder of Youth Lead the Change, a global youth leadership organization that empowers youth to reach their full potential as leaders. Emily received her B.A. in Social Anthropology and Psychology from Harvard University, where she played on the Varsity Women's Volleyball team. In her free time, Emily enjoys spending time outside and gathering together for shared meals. 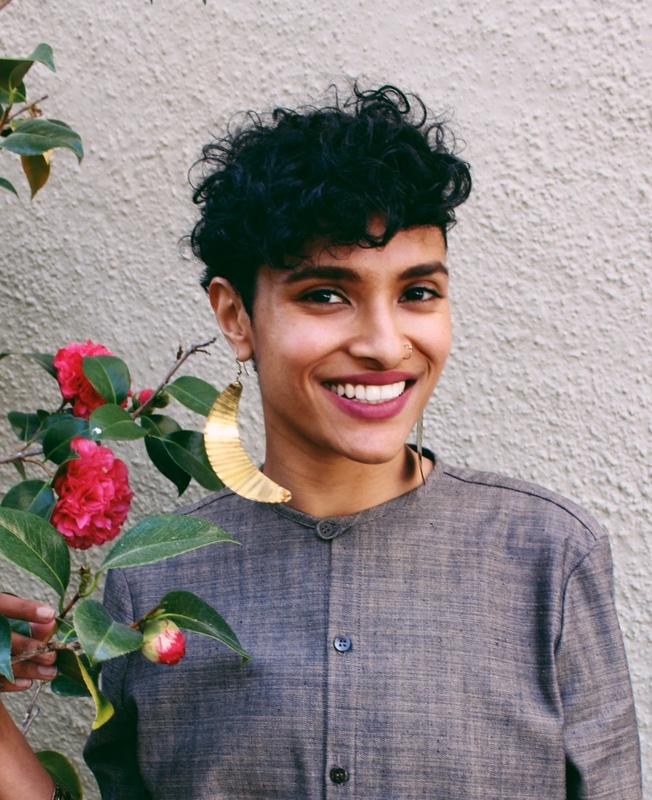 Chetna Mehta is a folk mixed media artist, creative entrepreneur and mental wellness consultant impassioned by merging spirituality and the healing arts with psychology and education. Her background includes international teaching in Colombia, India and Thailand, where she facilitated cultural exchanges, language and arithmetic learning through study and play; she specialized in staffing operations management at Netflix, Inc., overseeing immigration, relocation and recruiting coordination. She was a high school mental health and behavioral counselor in San Francisco's Mission District, collaborating with urban youth via talk therapy, case management and expressive arts workshops. Her professional mixed media work includes painting, illustration, commercial/fashion modelling, acting, artistic direction and photography. She received a BA in Social Sciences with a concentration in Organizations from Cal Poly University SLO, and a MA in Counseling Psychology from The Wright Institute in Berkeley. Her work today is with purpose to help up realize ourselves, our fullness and power, particularly through radical self-reflection in community circle; and to remember the interconnectedness between all of us. Find more details in tickets, inclusion and facilitation here. Do you want a tool to remind you of the helpful and relevant resources available to empower you and reduce stress? an effective and therapeutic wellness tool for soothing, empowerment & grounding. We'll take time to be creative in circle, bring awareness to our senses, & practice mindfulness while creating a resource tailored to each of us. She has a Master's in Counseling Psychology from the Wright Institute in Berkeley. She's facilitated creative workshops with teenagers in a school-based context, and with adults and multi-generational groups in intimate settings. A jam is a creative, live gathering of musicians who together spontaneously create a new sound, where the whole is greater than the sum of its parts. 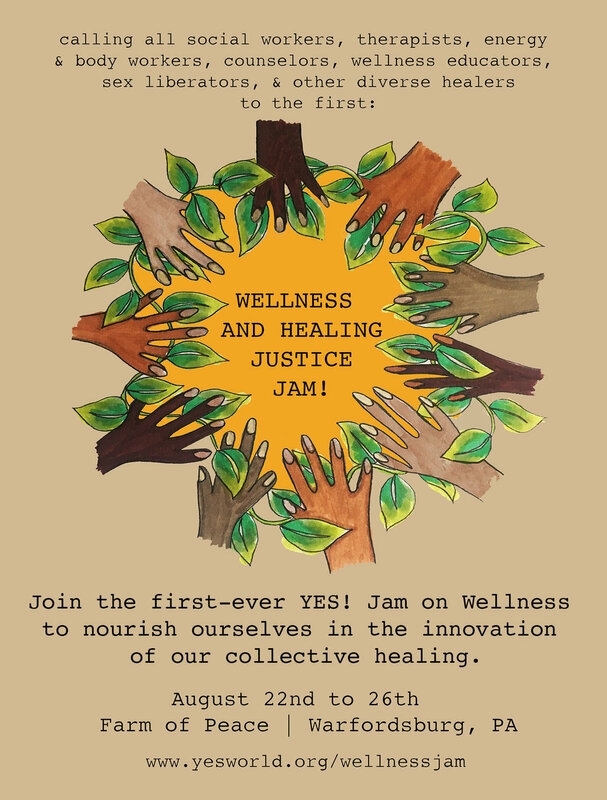 Like that, the Wellness and Healing Justice Jam is a place where diverse leaders and visionaries bring together their passions, openness, and unique perspectives in wellness and healing justice. How did I come to be a practitioner in this field? What does healing mean to me? How do we work with and/or through existing institutions, especially if they don’t align with our values all the time? How are we to be sustainable and valued in the field? How do we collaborate and create flexible co-learning communities as healers/practitioners across mediums, modalities, and issue focuses? How do we create an enduring support network of people using their healing passions for social change? How do we manage burnout and vicarious trauma -, individually, collectively, and intergenerationally? How can we co-create different and visionary systems of care, locally and beyond? Find more details here regarding application, tuition, facilitators and more.